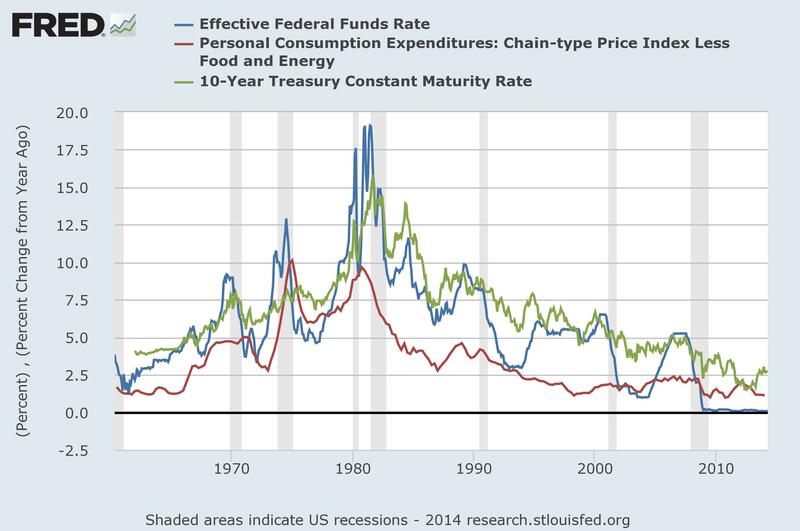 Recently there has been a debate about whether low interest rates counterintuitively actually leads deflation. Narayana Kocherlakota, President of the Minneapolis Fed, made such an argument a couple of years ago (but seems to have changed his mind now) and it seems like BIS’ Claudio Borio has been making an similar argument recently. Maybe surprisingly to some (market) monetarists will make a similar argument. We will just turn the argument upside down a bit. Let me explain. Most people would of course say that low interest rates equals easy monetary policy and that that leads to higher inflation – and not deflation. However, this traditional keynesian (not New Keynesian) view is wrong because it confuses “the” interest rate for the central bank’s policy instrument, while the interest rate actually in the current setting for most inflation targeting central banks is an intermediate target. To understand the problem at hand I think it is useful to remind my readers of the difference between monetary policy instruments, intermediate targets and policy goals. The central bank really only has one instrument and that is the control of the amount of base money in the economy (now and in the future). The central bank has full control of this. On the other hand interest rates or bond yields are not under the direct control of the central bank. Rather they are intermediate targets. So when a central bank says it is it is cutting or hiking interest rates it is not really doing that. It is intervening in the money market (or for that matter in the bond market) to change market pricing. But it is doing so by controlling the money base. This is why interest rates is an intermediate target. The idea is that by changing the money base the central bank can push interest rates up or down and there by influencing the aggregate demand to increase or decrease inflation is that is what the central bank ultimately wants to “hit”. Similarly Milton Friedman’s suggestion for central banks to target money supply growth is an intermediate target. The central bank does not directly control M2 or M3, but only the money base. So while interest rates (or bond yields) and the money supply are not money policy instruments they are intermediate targets. Something central banks “targets” to hit an the ultimate target of monetary policy. What we could call this the policy goal. This could be for example inflation or nominal GDP. Why is this discussion important? Well, it is important because because when central banks are confused about these concepts they also fail to send the right signals about the monetary policy stance. Milton Friedman of course famously told us that when interest rates are low it is normally because monetary policy has been tight. This of course is nothing else than what Irving Fisher long ago taught us – that there is a crucial difference between real and nominal interest rates. When inflation expectations increase nominal interest rates will increase – leaving real interest rates unchanged. The graph below pretty well illustrates this relationship. The correlation is pretty obvious – there is a positive (rather than a negative) correlation between on the one hand interest rates/bond yields and on the other hand inflation (PCE core). This of course says absolutely nothing about causality, but it seems to pretty clearly show that Friedman and Fisher were right – interest rates/yields are high (low) when inflation is high (low). This is of course does not mean that we can increase inflation by hiking interest rates. This is exactly because the central bank does not directly control interest rates and yields. Arguably the central bank can of course (in some circumstances) in the short decrease rates and yields through a liquidity effect. For example by buying bonds the central banks can in the short-term push up the price of bonds and hence push down yields. However, if the policy is continued in a committed fashion it should lead to higher inflation expectations – this will push up rates and yields. This is exactly what the graph above shows. Central bankers might suffer from money illusion, but you can’t fool everybody all of the time and investors, consumers and labourers will demand compensation for any increase in inflation. This also illustrates that it might very well be counterproductive for central bankers to communicate about monetary in terms of interest rates or yields. Because when central bankers in recent years have said that they want to keep rates ‘low for longer’ or will do quantitative easing to push down bond yields they are effectively saying that they will ensure lower inflation or even deflation. Yes, that is correct central bankers have effectively been saying that they want to fail. Said, in another if the central bank communicates as if the interest rate is it’s policy goal then when it says that it will ensure low interest rates then market expectation will adjust to reflect that. Therefore, market participants should expect low inflation or deflation. This will lead to an increase in money demand (lower velocity) and this will obviously on its own be deflationary. This is why “low for longer” if formulated as a policy goal could actually lead to deflation. Obviously this is not really what central bankers want. But they are sending confusing signals then they talk about keeping rates and yields low and at the same time want to “stimulate” aggregate demand. As consequence “low for longer”-communication is actually undermining the commitment to spurring aggregate demand and “fighting” deflation. Therefore, central bankers should stop communicating about monetary policy in terms of interest rates or bond yields. Instead central bankers should only communicate in terms of what they ultimately want to achieve – whether that is an inflation target or a NGDP target. In fact the word “target” might be a misnomer. Maybe it is actually better to talk about the goal of monetary policy. Said in another way interest rates and yields are endogenous. They reflect market expectations for inflation and growth. So when the Fed and other central banks in giving “forward guidance” in terms of interest rates they are seriously missing the point about forward guidance. The only forward guidance needed is what policy goal the central bank has and an “all-in” commitment to hit that policy goal by adjusting the money base. Finally, notice that I am NOT arguing that the Fed or any other central bank should hike interest rates to fight deflation – that would be complete nonsense. I am arguing to totally stop communicating about rates and yields as it totally mess up central bank communication. PS Scott Sumner and Tim Duy have similar discussions in recent blog posts. PPS Mike Belongia has been helpful in shaping my view on these matters. My friend Bob Mundell believes a massively over-valued dollar (ie, overly tight monetary policy) was proximate cause of financial freeze/meltdown. Larry’s comment reminded me of my long held view that we have to see the Great Recession in an international perspective. Hence, even though I generally agree on the Hetzel-Sumner view of the cause – monetary tightening – of the Great Recession I think Bob Hetzel and Scott Sumner’s take on the causes of the Great Recession is too US centric. Said in another way I always wanted to stress the importance of the international monetary transmission mechanism. In that sense I am probably rather Mundellian – or what used to be called the monetary theory of the balance of payments or international monetarism. Overall, it is my view that we should think of the global economy as operating on a dollar standard in the same way as we in the 1920s going into the Great Depression had a gold standard. Therefore, in the same way as Gustav Cassel and Ralph Hawtrey saw the Great Depression as result of gold hoarding we should think of the causes of the Great Recession as being a result of dollar hoarding. In that sense I agree with Bob Mundell – the meltdown was caused by the sharp appreciation of the dollar in 2008 and the crisis only started to ease once the Federal Reserve started to provide dollar liquidity to the global markets going into 2009. In 2008 when the crisis hit we saw a massive tightening of monetary conditions in the US. The monetary contraction was a result of a sharp rise in money (dollar!) demand and as the Federal Reserve failed to increase the money supply we saw a sharp drop in money-velocity and hence in nominal (and real) GDP. Hence, in the US the drop in NGDP was not primarily driven by a contraction in the money supply, but rather by a drop in velocity. The European story is quite different. In Europe the money demand also increased sharply, but it was not primarily the demand for euros, which increased, but rather the demand for US dollars. In fact I would argue that the monetary contraction in the US to a large extent was a result of European demand for dollars. As a result the euro zone did not see the same kind of contraction in money (euro) velocity as the US. On the other hand the money supply contracted somewhat more in the euro zone than in the US. Hence, the NGDP contraction in the US was caused by a contraction in velocity, but in the euro zone the NGDP contraction was caused by both a contraction in velocity and in the money supply, reflecting a much less aggressive response by the ECB than by the Federal Reserve. To some extent one can say that the US economy was extraordinarily hard hit because the US dollar is the global reserve currency. As a result global demand for dollar spiked in 2008, which caused the drop in velocity (and a sharp appreciation of the dollar in late 2008). In fact I believe that two factors are at the centre of the international transmission of the crisis in 2008-9. First, it is key to what extent a country’s currency is considered as a safe haven or not. The dollar as the ultimate reserve currency of the world was the ultimate safe haven currency (and still is) – as gold was during the Great Depression. Few other currencies have a similar status, but the Swiss franc and the Japanese yen have a status that to some extent resembles that of the dollar. These currencies also appreciated at the onset of the crisis. …I hope to have demonstrated above that the increase in dollar demand in 2008 not only hit the US economy but also led to a monetary contraction in especially Europe. Not because of an increased demand for euros, lats or rubles, but because central banks tightened monetary policy either directly or indirectly to “manage” the weakening of their currencies. Or because they could not ease monetary policy as members of the euro zone. In the case of the ECB the strict inflation targeting regime let the ECB to fail to differentiate between supply and demand shocks which undoubtedly have made things a lot worse. So there you go – you have to see the crisis in an international monetary perspective and the Fed could have avoided the crisis if it had acted to ensure that the dollar did not become significantly “overvalued” in 2008. So yes, I am as much a Mundellian (hence a Casselian) as a Sumnerian-Hetzelian when it comes to explaining the Great Recession. A lot of my blog posts on monetary policy in small-open economies and currency competition (and why it is good) reflect these views as does my advocacy for what I have termed an Export Price Norm in commodity exporting countries. Irving Fisher’s idea of a Compensated Dollar Plan has also inspired me in this direction. That said, the dollar should be seen as an indicator or monetary policy tightness in both the US and globally. The dollar could be a policy instrument (or rather an intermediate target), but it is not presently a policy instrument and in my view it would be catastrophic for the Fed to peg the dollar (for example to the gold price). Unlike Bob Mundell I am very skeptical about fixed exchange rate regimes (in all its forms – including currency unions and the gold standard). However, I do think it can be useful for particularly small-open economies to use the exchange rate as a policy instrument rather than interest rates. Here I think the policies of particularly the Czech, the Swiss and the Singaporean central banks should serve as inspiration. 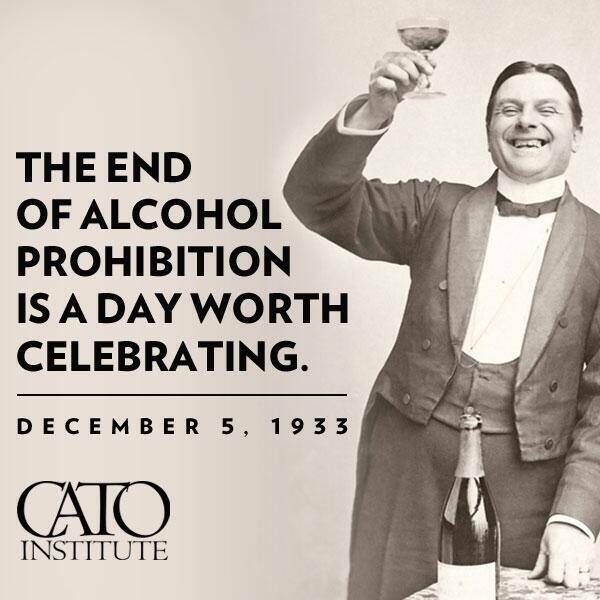 Today it is 80 years ago that US alcohol prohibition was ended. Interestingly enough two of my favorite monetary thinkers of the time – Irving Fisher and Clark Warburton – had strong views on prohibition. Hence, Irving Fisher was a strong advocate of prohibition, while Clark Warburton was strongly against prohibition. I would especially encourage everybody to have a look at Clark Warburton’s empirical work on prohibition in his Ph.D. dissertation, which was published as The Economic Results of Prohibition in 1932 – one year ahead of the end of prohibition. Fisher and Warburton had very similar – monetarist – views on monetary policy and theory, but they certainly did not agree on prohibition. Later an other monetarist – Milton Friedman – picked up on a similar theme and he was very outspoken against the US War on Drugs. As I noted in my previous post I believe that an end to the War on Drugs would be a quite positive supply shock to the US economy and would improve US public finances. The end of prohibition in 1933 likely had a similar positive effect on the US economy, but unfortunately other regulations such are the National Industrial Recovery Act (NIRA) had much more negative supply effects. Said in another way Roosevelt was right on alcohol and money, but wrong on nearly everything else. I stole this picture from Cato Institute. Here is what Cato’s David Boaz has to say about the day to day. I strongly believe that we can learn a lot about the present crisis from studying economic and monetary history. Particularly the study of the Great Depression should be of interest to anybody who is interested in the causes of the present crisis and how to get us out of the crisis. Scott Sumner would hence tell you that he has read most of what was printed in the financial section of the New York Times in early 1930s. I think Scott is right when he is telling us that we should read old newspaper articles. My favourite source for Great Depression newspaper articles is the National Library of Australia’s newspaper database Trove. The Trove newspaper database makes it possible to follow the discussion about economic and financial matters for example during the 1930s. It is amazing how many interesting articles one will find there. The latest piece I have found is a very good article about Irving Fisher’s Compensated dollar plan. Below I have reproduced parts of the article. You can read it all on Trove. The article appeared in The Mercury on May 18 1933. I have added my own comments. In “Booms and Depressions” Professor Irving Fisher of Yale University (U.S.A.). has… set out to discover the causes of depressions and their cures. He is best known internationally as the originator of a plan whose object is to keep prices stable by varying as may be required the gold content of legal tender money. In his preface he indicates that the main conclusion of his book is that depressions are for the most part preventable, and that their prevention requires a definite policy, in which the central banking system of each country must play an important role. Such knowledge as he has obtained on the subject, he declares, he has only recently acquired. That over-production is the cause of depressions he will not have. There is no over-production, nor is there anything wrong with the mechanical means of the distribution of production, nor with the roads, the bridges, or the transport systems by land or sea. But he asks as to the other distributive mechanism – the money mechanism – is there any more reason why the money mechanism should be proof against getting out of order than a railroad or a ship canal. Profits are measured in money, and if money should become deranged, is it not at least probable that the derangement would affect all profits in one way at one time? This is what he sets out to prove. LC: Hence, you here see that Fisher’s view is that recessions are caused by a monetary disequilibrium. This of course is exactly what Market Monetarists argue today. The problem is not some inherent instability of the market system, but rather instability created by monetary policy failure. Debts are a necessary part of the establishment of business. For business to be carried out in volume as we know it today debts must be incurred. Debts may lead to over-indebtedness, which he defines as that degree of in-debtedness which multiplies unduly the chances of becoming insolvent. Pressure caused by over-indebtedness leads to distress selling, which prevents the operations of the law of supply and demand, and when a whole community is involved in distress selling the effect is to lower the general price level. It does this because the stampede liquidation involved there by actually shrinks the volume of currency, that is, deposit currency. Three of the main factors causing depressions are in this manner shortly stated-debts, currency volume, price level. The al- teration of tho price level causes an alteration of the real measures of money-dollar in tho United States, pound in Great Britain and Australia. When the price level falls in the manner stated it reacts on the debt situation, which first caused the alteration. So he concludes that when the expanding dollar (that is when the value of the dollar increases) grows faster than the reduction of the number of dollars of debt, liquidation docs not really liquidate, so that the depression goes right on, until there are sufficient bankruptcies to wipe out the activating cause the debts. LC: Fisher’s comments about indebtedness seem highly relevant today. What Fisher is arguing is that deleveraging is a necessary evil if we have become over-indebted, but if the price level is allowed to contract at during the deleveraging process (the “liquidation”) then the desirable process of “liquidation” will become depressionary. This of course is the argument that Market Monetarists make today when we argue that the euro crisis is not a debt crisis, but a monetary crisis. Yes, it is necessary to reduce debt levels in parts of the euro zone but this process is unlikely to end well if monetary policy remains too tight. Similarly Fischer’s discussion shows that the debate between one the one hand Keynesian fiscalists and the ‘Austerians’ on the other hand is a phony debate. The Austerians are of course right when they argue that if you have become overly indebted you have to reduce debts, but the Keynesians are equally right that the collapse in aggregate demand is the main cause of the present crisis. Where both sides are wrong is their common focus on fiscal policy. Irving Fisher would have told them to focus on monetary policy instead. Yes, we should reduce debt levels (if we are overly indebted), but the central bank needs to ensure nominal stability so this process does not become deflationary. But Why, he asks, suffer from this dollar disease, this variation in the value of the dollar? Should gold coin become copious in the nick of time the gold inflation might counteract the credit deflation. The same result might come from paper inflation for instance, by way of financing a war. That inflation would be a matter ot exercising control of the currency. It should be equally clear, Professor Irving Fisher considers, that deflation or dollar bulging is not an “act of God.” We need not wait for a happy accident to neutralise deflation; we may frustrate, it by design. Man has, or should have, control of his own currency. If we must suffer from the debt disease, why also catch the dollar disease? LC: Deflation is not a necessary outcome of the “bust”. 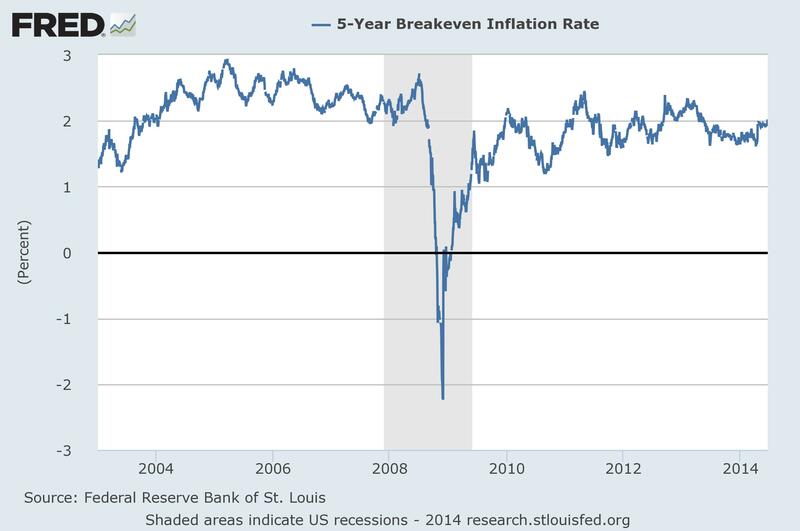 Deflation is a result of overly tight monetary policy. Irving Fischer knew this very well. Friedman learned that from studying Fisher and Market Monetarists know that today. The remedy, Professor Fisher declares is first a correction of the price-level by reflation and then henceforward its safe-guarding. He admits that the problem of “what price-level?” is difficult, because the matter what year may be chosen as the year whose level should be restored, it will do injustice. He proposes, therefore, as between the years from 1929 to 1932 to put the price-level part of the way back, so that the injustice would be shared by a great part of two groups, the debtors and the creditors. …Reflation is the duty of Central Banks, he considers, through expanding thc currency and credit, and when sufficient reflation has been obtained to serve the purpose sought, the currency and credit should be so managed that the general price index after it has been raised to the height required should be maintained at that height. LC: While Fisher focused on the price level Market Monetarists today focus on the level of nominal GDP, but the policy message is basically the same – a monetary contraction caused the crisis so monetary policy needs to be eased to “undo” the damage done by monetary tightening. The question then is how much? What level of prices/NGDP should be targeted? This was a challenge to Fisher and that is a challenge to Market Monetarists today. If, in spite of all other efforts to regulate the price level, the purchasing power of gold over goods should fall, the weight of the gold dollar or sovereign should be increased; or if the purchasing power of gold should rise, the weight of the dollar or sovereign would be correspondingly reduced. Under this plan the actual coinage of gold would be abandoned, and instead of gold I coins, gold bars would be used to redeem the gold certificates. Only gold certificates would circulate, and the price of the bars in terms of these certificates I would be varied from time to time. One advantage of the compensated gold coin plan would be that any nation could operate it alone. The inconvenience of each alteration in the gold coin’s weight causing a corresponding alteration in the foreign exchange would be, he considers, a small matter. LC: Hence, Irving Fisher was suggesting to revalue or devalue the dollar against the price of gold to ensure a stable price level. Hence, if the price level dropped below the targeted level then the dollar would be devalued against gold, while if prices rose above the targeted level then the dollar would be revalued. The Market Monetarist proposal that central banks should use an NGDP future to conduct monetary policy is very much in the spirit of Fisher’s compensated dollar plan. Both are rule based policies that ensures nominal stability and at the same time strongly limits the central bank’s discretionary powers. We can learn a lot from history so I encourage everybody interested in monetary history to have a look at the Trove database and similar newspaper archives and please let me know if you find something interesting that can teach us more about how to get out of the present crisis. I have always been rather skeptical about fixed exchange rate regimes even though I acknowledge that they have worked well in some countries and at certain times. My dislike of fixed exchange rates originally led me to think that then one should advocate floating exchange rates and I certainly still think that a free floating exchange rate regime is much preferable to a fixed exchange rate regime for a country like the US. However, the present crisis have made me think twice about floating exchange rates – not because I think floating exchange rates have done any harm in this crisis. Countries like Sweden, Australia, Canada, Poland and Turkey have all benefitted a great deal from having floating exchange rates in this crisis. However, exchange rates are really the true price of money (or rather the relative price of monies). Unlike the interest rate which is certainly NOT – contrary to popular believe – the price of money. Therefore, if we want to change the price of money then the most direct way to do that is through the exchange rate. Furthermore, most central banks in the world today are “interest rates target’ers”. However, with interest rates effectively at zero it is mentally (!) impossible for many central banks to ease monetary policy as they operationally are unwilling to venture into using other monetary policy instruments than the interest rate. Obviously numerous central banks have conducted “quantitative easing”, but it is also clear that many (most) central bankers are extremely uncomfortable using QE to ease monetary policy. Therefore, the exchange rate channel might be a highly useful instrument that might cause less concern for central bankers and it might be easier to understand for central bankers and the public alike. In my post a year ago I suggested that Irving Fisher’s proposal for a Compensated Dollar Plan might be an inspiration for central bankers in small open economies. Irving Fisher first suggested the compensated dollar plan in 1911 in his book The Purchasing Power of Money. The idea is that the dollar (Fisher had a US perspective) should be fixed to the price of gold, but the price should be adjustable to ensure a stable level of purchasing power for the dollar (zero inflation). Fisher starts out by defining a price index (equal to what we today we call a consumer price index) at 100. Then Fisher defines the target for the central bank as 100 for this index – so if the index increases above 100 then monetary policy should be tightened – and vis-a-vis if the index drops. This is achieved by a proportional adjustment of the US rate vis-a-vis the the gold prices. So it the consumer price index increase from 100 to 101 the central bank intervenes to strengthen the dollar by 1% against gold. Ideally – and in my view also most likely – this system will ensure stable consumer prices and likely provide significant nominal stability. Irving Fisher campaigned unsuccessfully for his proposals for years and despite the fact that is was widely discussed it was not really given a chance anywhere. However, Sweden in the 1930s implemented a quasi-compensated dollar plan and as a result was able to stabilize Swedish consumer prices in the 1930s. This undoubtedly was the key reason why Sweden came so well through the Great Depression. I am very certain that had the US had a variation of the compensated dollar plan in place in 2008-9 then the crisis in the global economy wold have been much smaller. There is no doubt that the Compensated dollar plan fits well into Market Monetarist thinking. It uses market prices (the exchange rate and gold prices) in the conduct of monetary policy rather than a monetary aggregate, it is strictly ruled based and it ensures a strong nominal anchor. From a Market Monetarists perspective I, however, have three reservations about the idea. First, the plan is basically a price level targeting plan (with zero inflation) rather than a plan to target nominal spending/income (NGDP targeting). This is clearly preferable to inflation targeting, but nonetheless fails to differentiate between supply and demand inflation and as such still risk leading to misallocation and potential bubbles. This is especially relevant for Emerging Markets, which undergoes significant structural changes and therefore continuously is “hit” by a number of minor and larger supply shocks. Second, the plan is based on a backward-looking target rather than on a forward-looking target – where is the price level today rather than where is the price level tomorrow? In stable times this is not a major problem, but in a time of shocks to the economy and the financial system this might become a problem. How big this problem is in reality is hard to say. Finally third, the fact that the plan uses only one commodity price as an “anchor” might become a problem. As Robert Hall among other have argued it would be preferable to use a basket of commodities as an anchor instead and he has suggest the so-called ANCAP standard where the anchor is a basket of Ammonium Nitrate, Copper, Aluminum and Plywood. My suggestion is that it the the small open economy (SOE) announces that it will peg a growth path for NGDP (or maybe for nominal wages as data might be faster available than NGDP data) of for example 5% a year and it sets the index at 100 at the day of the introduction of the new monetary regime. Instead of targeting the gold price it could choose to either to “peg” the currency against a basket of other currencies – for example the 3-4 main trading partners of the country – or against a basket of commodities (I would prefer the CRB index which is pretty closely correlated with global NGDP growth). Thereafter the central bank should every month announce a monthly rate of depreciation/appreciation of the currency against the anchor for the coming 24-36 month in the same way as most central banks today announces interest rate decisions. The target of course would be to “hit” the NGDP target path within a certain period. The rule could be fully automatic or there could be allowed for some discretion within the overall framework. Instead of using historical NGDP the central bank naturally should use some forecast for NGDP (for example market consensus or the central bank’s own forecast). No more blogging for today – Merry Christmas to all of my readers around the world. I am writing this while I am flying with Delta Airlines over the Atlantic. I will be speaking about the European crisis at a seminar on Friday at Brigham Young University in Provo, Utah. I must admit that it has been a bit of a challenge to blog in recent weeks. Mostly because both my professional and my private life have been demanding. After all blogging is something I do in my spare time. So even though I wanted to blog a lot about the latest FOMC decision and the world in general I have simply not been able to get out the message. Furthermore – and this will interest many of my readers – Robert Hetzel and his wonderful wife Mary visited Denmark last week. Bob had a very busy schedule – and so did I as I attended all of Bob’s presentations in Copenhagen that week. Bob told me before his presentations that I would not be disappointed and that none of the presentations would be a “rerun”. Bob is incredible – all of this presentations covered different countries and topics. Obviously there was a main theme: The central banks failed. I must admit after three days of following Bob and having the privilege to hear him talk about the University of Chicago in 1970s and his stories about Milton Friedman I simply had an mental “overload”. I had a very hard time expressing my monetary policy views – and the major policy turnaround at the Fed didn’t make it easier. Anyway I feel that I have to share some of Bob’s incredible insight after his visit to Copenhagen, but I also feel that whatever I write will not do justice to his views. So I have chosen a different way of doing it. Instead of telling you what Bob said in Copenhagen I will try to tell the story about how (a clever version of) New Keynesian economics and Monetarism could come to similar conclusions – and that merger is really Market Monetarism. Why is that? I have for some time wanted to write something about a couple of new and very interesting, but slightly technical paper by Mike Belongia and Peter Ireland. Both Mike and Peter have a monetarist background, but Peter has done a lot work in the more technical New Keynesian tradition. And that is what I will focus on here, but I promise to return to Mike’s and Peter’s other papers. The other day my colleague and good friend Jens Pedersen sent me a paper Peter wrote in 2010 – “A New Keynesian Perspective on the Great Recession”. When I read the paper I realised how I was going to write the story about Bob’s visit to Copenhagen. Bob’s and Peter’s explanations of the Great Recession are exactly the same – just told within slightly different frameworks. Bob first wrote a piece on the Great Recession it in 2009 and Peter wrote his piece in 2010. Peter and Bob are friends and both have been at the Richmond fed so it is not totally surprising that their stories of what happened in 2008-9 are rather similar, but I nonetheless think that we can learn quite a bit from how these two great intellects think about the crisis. So what is the common story? In think we have to go back to Milton Friedman’s Permanent Income Hypothesis (PIH). While at the Richmond Peter while at the Richmond fed in 1995 actually wrote about PIH and how it could be used for forecasting purposes. And one thing I noticed at all of Bob’s presentations in Copenhagen was how he returned to Irving Fisher and the determination of interests as a trade off between consumption today and in the future. Friedman and Fisher in my view are at the core of Bob’s and Peter’s thinking of the Great Recession. So here is the Peter and Bob story: In 2007-8 the global economy was hit by a large negative supply shock in the form of higher oil prices. That pushed up US inflation and as a consequence US consumers reduced their expectations for their future income – or rather their Permanent Income. With the outlook for Permanent Income worsening interest rates should drop. However, as interest rates hit zero the Federal Reserve failed to ease monetary policy because it was unprepared for a world of zero interest rates. The Fed should of course more aggressively moved to a policy of monetary easing through an increase in the money base. The fed moved in that direction, but it was too late and too little and as a result monetary conditions tightened sharply particularly in late 2008 and during 2009. That can be described within a traditional monetarist framework as Bob do his excellent book “The Great Recession – policy failure or market failure” (on in his 2009 paper on the same topic) or within an intelligent New Keynesian framework as Peter do in his 2010 paper. Peter uses the term a “New Keyensian Perspective” in his 2010. However, he does not make the mistakes many New Keynesians do. First, for all he realizes that low nominal interest rates is not easy monetary policy. Second, he do not assume that the central bank is always making the right decisions and finally he realizes that monetary policy is not out of ammunition when interest rates hit zero. Therefore, he might as well have called his paper a “New Friedmanite-Fisherian Perspective on the Great Recession”. Anyway, try read Bob’s book (and his 2009 paper) and Peter’s paper(s). Then you will realize that Milton Friedman and Irving Fisher is all you need to understand this crisis and the way out of is. I am finalizing this post after having arrived to my hotel in Provo, Utah and have had a night of sleeping – damn time difference. I look forward to some very interesting days at BYU, but I am not sure that I will have much time for blogging. I hate getting into debates where different bloggers go back and forth forever and never reach any conclusion. I am not blogging to get into debates, however, I must admit that Steven Williamson’s recent posts on NGDP level targeting have provoked me quite a bit. This is a very odd comment coming from somebody who calls himself a (New) Monetarist. It is at the core of monetarism in the sense of Friedman, Brunner, Meltzer, Cagan, Schwartz, Warburton and Yeager etc. that nominal GDP is determined by the central bank and no monetarist has ever acknowledged that there is a liquidity trap. Williamson claims that he does not agree with everything Friedman said, but I wonder what Friedman said he agrees with. If you don’t believe that NGDP is determined by the central bank then it makes absolutely no sense to call yourself a monetarist. Furthermore, if you don’t think that the Fed can hit an NGDP target how could you think it could hit an inflation target? Both changes in NGDP and in prices are monetary phenomena. Anyway, let’s get back to the question whether the central bank can hit an NGDP target and what instruments could be used to hit that target. The simplest way to do it is actually to use the exchange rate channel. Let’s assume that the Federal Reserve wants to increase the US NGDP level by 15% and that it wants to do it by the end of 2013. Scott has suggested using NGDP futures to hit the NGDP target, but let’s assume that is too complicated to understand for the critics and the Fed. Instead the Fed will survey professional forecasters about their expectations for the level of NGDP by the end of 2013. The Fed will then announce that as long as the “consensus” forecast for NGDP is below the target the Fed will step up monetary easing. The Fed will do the survey once a month. Let’s start out with the first announcement under this new regime. Initially the forecasters are skeptical and forecast NGDP to be 12% below target. As a consequence the Fed announces a Swiss style exchange target. It simply announces that it will intervene in the FX market buying unlimited amounts of foreign currency until the US dollar has weakened 20% in nominal effective terms (and yes, the Fed has the instruments to do that – it has the printing press to print dollars). I am pretty sure that Williamson would agree that that directly would increase US NGDP (if not I would love to see his model…). The following month the forecasters will likely have moved their forecasts for NGDP closer to the target level. But we might still have too low a level of forecasted NGDP. Therefore, the Fed will the following month announce a further “devaluation” by lets say 5%. The process will continue until the forecasted level for NGDP equals the target level. If the consensus forecast starts to overshoot the target the Fed will simply announce that it will reverse the process and revalue the dollar. Therefore there is certainly no reason to argue 1) that the Fed can not hit any NGDP target 2) that the Fed does not have an instrument. The exchange rate channel can easily do the job. Furthermore, if the Fed announces this policy then it is very likely that the market will be doing most of the lifting. The dollar would automatically appreciate and depreciate until the market expectations are equal to the NGDP target. If you have heard all this before then it is because this a variation of Irving Fisher’s compensated dollar plan and Lars E. O. Svensson’s foolproof way out of a liquidity trap. And yes, I have previously suggested this for small open economies, but the Fed could easily use the same method to hit a given NGDP target. Update: I should note that the example above is exactly that – an example. I use the example to illustrate that a central bank can always increase NGDP and that the exchange rate channel is an effective tool to achieve this goal. However, the numbers mentioned in my post are purely “fictional” and again it example rather than a policy recommendation. That said, I am pretty that if the Fed did exactly as what I suggest above the US would very fast bee out of this crisis. The same goes for the ECB. Update II: Marcus Nunes and Bill Woolsey also comment on Williamson. Nick Rowe comments on David Adolfatto’s anti-NGDP targeting post(s). It is Christmas time and I am spending time with the family so it is really not the time for blogging, but just a little note about something I have on my mind – Irving Fisher’s Compensated dollar plan and how it might be useful in today’s world – especially for small open economies. I am really writing on a couple of other blog posts at the moment that I will return to in the coming days and weeks, but Irving Fisher is hard to let go of. First of all I need to finalise my small series on modern US monetary history through the lens of Quasi-Real Indexing and then I am working on a post on bubbles (that might in fact turn into a numbers of posts). So stay tuned for these posts. Back to the Compensated dollar plan. I have always been rather skeptical about fixed exchange rate regimes even though I acknowledge that they have worked well in some countries and at certain times. My dislike of fixed exchange rates originally led me to think that then one should advocate floating exchange rates and I certainly still think that a free floating exchange rate regime is much preferable to a fixed exchange rate regime for a country like the US. However, the present crisis have made me think twice about floating exchange rates – not because I think floating exchange rates have done any harm in this crisis. Countries like Sweden, Australia, Canada, Poland and Turkey have all benefitted a great deal from having floating exchange rates in this crisis. However, exchange rates are really the true price of money (or rather the relative price of monies). Unlike the interest rate which is certainly NOT – contrary to popular believe – the price of money. Therefore, if we want to change the price of money then the most direct way to do that is through the exchange rate. As a consequence I also come to think that variations of Fisher’s proposal could be an idea for small open economies – especially as these countries typically have less developed financial markets and due to financial innovation – in especially Emerging Markets – have a hard time controlling the domestic money supply. Furthermore, a key advantage of using the exchange rate to conduct monetary policy is that there is no “lower zero bound” on the exchange rate as is the case with interest rates and the central bank can effectively “circumvent” the financial sector in the conduct of monetary policy – something which is likely to be an advantage when there is a financial crisis. But lets first start out by revisiting Fisher’s compensated dollar plan. Irving Fisher first suggested the compensated dollar plan in 1911 in his book The Purchasing Power of Money. The idea is that the dollar (Fisher had a US perspective) should be fixed to the price of gold, but the price should be adjustable to ensure a stable level of purchasing power for the dollar (zero inflation). Fisher starts out by defining a price index (equal to what we today we call a consumer price index) at 100. Then Fisher defines the target for the central bank as 100 for this index – so if the index increases above 100 then monetary policy should be tightened – and vis-a-vis if the index drops. This is achieved by a proportional adjustment of the US rate vis-a-vis the the gold prices. So it the consumer price index increase from 100 to 101 the central bank intervenes to strengthen the dollar by 1% against gold. Ideally – and in my view also most likely – this system will ensure stable consumer prices and likely provide significant nominal stability. If we take this reservations into account we get to a proposal for an exchange rate based NGDP target regime which I believe would be particularly suiting for small open economies and Emerging Markets. I have in an earlier post spelled out the proposal – so I am repeating myself here, but I think the idea is worth it. It could be done, but will anybody dare? Central bankers are conservative people and they don’t go around and change their monetary policy set-up on a daily basis. Nonetheless it might be time for central banks around the world to reconsider their current set-up as monetary policy far from having been successfully in recent years. I believe Irving Fisher’s Compensated dollar plan is an excellent place to start and I have provided a (simple) proposal for how small-open economies might implement it. I used to think of that Scott mostly was influenced by his old teacher Milton Friedman, but I increasingly think that Scott is mostly influenced by Irving Fisher. I wonder if Bordo and Rockoff would ever write a paper about Fisher’s influence on Sumner…or maybe Scott will write it himself? I especially find Scott’s “link” to the compensated dollar plan intriguing as I fundamentally think that Scott’s intellectual love affair with “Market Keynesian” Lars E. O. Svensson has to be tracked back to exactly this plan. PS I am intrigued by the compensated dollar plan (CDP) and I increasingly think that variations of the CDP could be a fitting monetary policy set-up for Emerging Markets and small open economies with underdeveloped financial markets. One day I might get my act together and write a post on that topic.